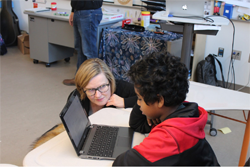 On Wednesday, December 12th, Our students, staff, and school community shone during our first ever Story of Self Day. We had almost 200 visitors ranging from members of Dr. Salim's Cabinet to School Committee Members, Boston University faculty, DESE staff, parents of rising 5th graders, Putnam Ave. families, community partners, and a record company C.E.O. All of whom celebrated with us the courage of our amazing students as they shared their personal narratives. This experience confirmed that our students are more than capable of being focused, brave, poised, respectful, and courageous. Our students proved that they could maintain both a safe and brave space for each other as they treated on another with respect, dignity, and confidentiality through the entirety of this process and supported one another in being publicly vulnerable. They were deeply respectful of of each other’s stories, our guests, and our reputation as a healthy and thriving school community. We also learned just how exhausting a three hour time block was and that we need a tighter window of time next year to ensure that visitors are able to see as many students as possible! Although this work may seem new to you, we have been working on Story of Self for the past two years as a faculty and school. Our work last year began with staff in August (2017) when we introduced Marshall Ganz’ framework of Story of Self, Story of Us, and Story of Now. Story of Self asks individuals to consider their values and frame a story from their experience that highlights a choice, a challenge, and an outcome. Crafting and sharing this story creates an experience where staff and students can reflect, embrace the personal power of framing and telling their own story, form deep connections, and exhibit our core value of pride (“We take pride in our identities and the impact we have on both individuals and larger society. We think not only about the here and now, but about the future as well, considering carefully how each choice we make will impact the future of our own lives as individuals and the future of our collective community.”). It is important to note that “a good public narrative is drawn from the series of choice points that have structured the ‘plot’ of your life – the challenges you faced, choices you made, and outcomes you experienced. [And] the power in your story of self is to reveal something of yourself and your values—not your deepest secrets, but the key shaping moments in your life” (Ganz). 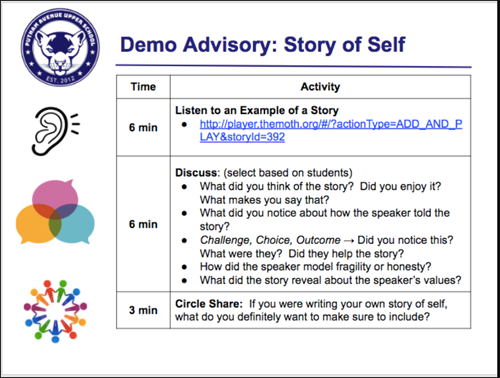 In staff meetings and common planning times during the early part of the 2017-2018 school year, staff learned about story of self and were provided with organizers and time to craft their own story of self, as well as to participate in simulations that modeled how to work on story of self with students in advisory. All of this work drafting, revising, and practicing culminated for teachers in a staff meeting where they presented to one another their stories. 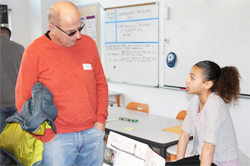 Then, this work was replicated in advisories with our students, also culminating in a day where 6th graders presented to their advisories and 7th and 8th graders presented to their advisories and families. This year, we included a public, school-wide presentation day as mentioned above. For more resources, please see below. As we continue exploring and honoring our identities, I am looking forwarding to seeing as many of you as possible at our upcoming Community Conversation which will take place on Thursday, January 24th, at 5:30pm at the Cambridge Community Center, located at 5 Callender Street, Cambridge MA 02139.